The climbers that fare the best on Mount Kilimanjaro are the ones that prepare adequately. Physical fitness is an important factor in determining your success on Kilimanjaro. Because climbing Kilimanjaro entails several hours of walking uphill on a daily basis, it is essential that climbers' legs are strong enough to endure this type of activity. To train, going on day hikes is ideal because it most closely resembles trekking on the mountain. If possible, find hiking trails that have extensive uphill sections, at higher altitudes. Some people train exclusively at an indoor gym, on a stair climber machine. It is recommended to train for about three days a week, for at least two months. Climbers must be prepared for all types of weather on the mountain. Wet conditions and extremely cold temperatures are common on the mountain and all climbers should have the proper clothing to function safely under these circumstances. The clothing required to climb Kilimanjaro includes, but is not limited to: waterproof jacket and pants, insulated jackets, shirts, pants, boots, hat, gloves, sunglasses, backpack. Layering is the best method to stay warm on Kilimanjaro. To enter Tanzania, most people will require a valid passport and visa. Passports need to be valid for at least another six months from your date of entry. Visas for most citizens can be purchased upon arrival. Citizens of the USA, Canada, and the UK are required to have a passport and visa. Kilimanjaro Airport (JRO) is the most convenient arrival point for travelers intending on climbing Kilimanjaro. Flight costs vary depending on season, and can range from $1400 to $4000. KLM is the only major airline that serves Kilimanjaro Airport. Moshi is the gateway town to the park and is located approximately 45 kilometers from the airport. Moshi is the starting point for most treks, though some operators launch from Arusha, a larger city located slightly father away. There are several recommended vaccinations, immunizations and medications for travel to Tanzania. Climbers should consult with their medical practioner or travel clinic to determine which ones are right for them. Lastly, travel insurance will cover expenses that arise due to unseen circumstances. Most travel insurance covers trip cancellation, lost luggage and medical expenses. 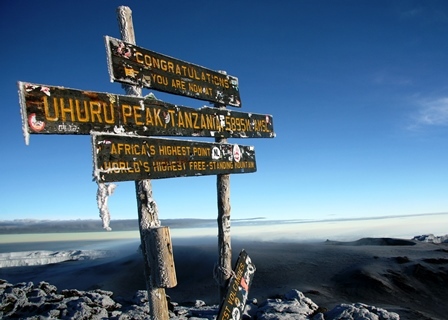 What do I Need to Climb Kilimanjaro?